Today as Mars trines Neptune, you may feel the need to step away from all the hustle and bustle of the outside world and retreat to your own private sanctuary. The High Priestess represents intuition, serenity and wisdom. She encourages you to seek guidance from within and to heed your inner voice. In this respect you may need to find your place of quiet and solitude in order to best access her messages. The High Priestess in this card steps out under the night sky from behind a veiled canopy. She stands between the moon and stars to commune with the magical creatures and night-blooming lilies in her garden. Notice how she strains to extract the symbols from the ethers around her. The impressions she receives are not always be easy to decipher. The High Priestess is wise and perceptive but even she has to make sense of all the messages she receives. Like the High Priestess in this card, you may need to make time for quiet reflection and introspection. The Mars / Neptune aspect is harmonious in nature. But it’s still Neptune. There’s still the potential for getting your wires crossed. Getting away and communing with nature or going on a spiritual retreat are both good options. But just taking time to quiet your mind can also help you to satisfy these leanings. 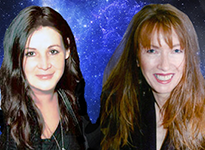 Pay attention to messages you receive and synchronicities you notice during this time. You can unlock mysteries that you struggle with analytically just by learning to trust your intuition. 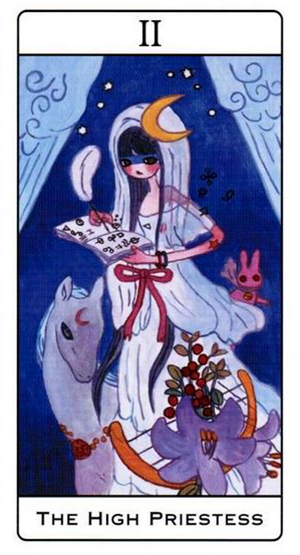 The card used for today’s tarotscope — the High Priestess — is from the Aya Takano Tarot, designed by Japanese artist Aya Takano.